The South of Vietnam, including a few days on the beach, plus Cambodia! Arriving at Ho Chi Minh City, our Vietnam guide will be at the airport to welcome you and transfer you to your hotel. Today's city tour includes The Reunification Palace (the former Presidential Palace), Post Office, Notre Dame Cathedral, Lam Son Square, Ben Thanh Market and Thien Hau pagoda, the Museum of the HCM Campaign and other sights as time permits. Evening dinner at a local Vietnamese restaurant. After breakfast, we depart Can Tho to Phung Hiep (35 km) by car. Upon arrival at Phung Hiep, we take a boat trip to a floating market. Lunch en route. Continue to Soc Trang to visit Bat Pagoda and Khmer Museum, then drive back to Can Tho. After breakfast we depart Can Tho to Ho Chi Minh city (169km), taking lunch en route, and transfer to hotel. Afterwards, at leisure. Today we leave Ho Chi Minh City by road for Phan Thiet. The scenic 200km drive on Highway One passes through the bustling city of Bien Hoa before cutting through dense rubber plantations. 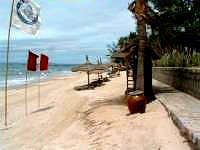 Nearer to Phan Thiet the terrain changes to arid semi-desert with cactus plants and strange looking dragonfruit trees. After arrivong in Phan Thiet in the late morning, we check into resort and the rest of day is free to relax by the pool or on the sandy beach. After breakfast we leave Phan Thiet for Ho-Chi-Minh City airport, where we take a short flight to Siem Reap. At Siem Reap airport, our Cambodia guide will meet you and transfer you to your hotel and the rest of the day is at leisure. This 14 day trip to the south of Vietnam & Cambodia is a little more leisurely!